Sometimes all you need is a mug of hot chocolate (topped with whipped cream, of course) and a piece of toast smothered in honey to realize that all is right in the world. For the moment, at least. Yes! I don't care how warm it is outside, sometimes some good hot chocolate is all a girl really needs. whoa, i seriously need that today!! I've never had toast with honey before. Have to try that. pretty picture, pretty thoughts. love that i found your blog today. Ditto what Rachael said. Would never have thought of honey, but it sounds/looks delish! OHHH. 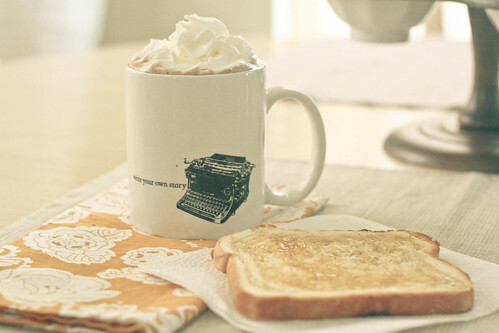 My favorite treat ever is to make hot cocoa and toast. And dip my toast in the cocoa. Is that weird? Ooh, I LOVE that mug! I have a typewriter just like that. Mmmm, hot chocolate!!! And toast, I love toast, though I go the butter and cinnamon sugar route!!! Mmm that looks delicious. I love my toast with butter and cinnamon sugar.